Apoptosis. 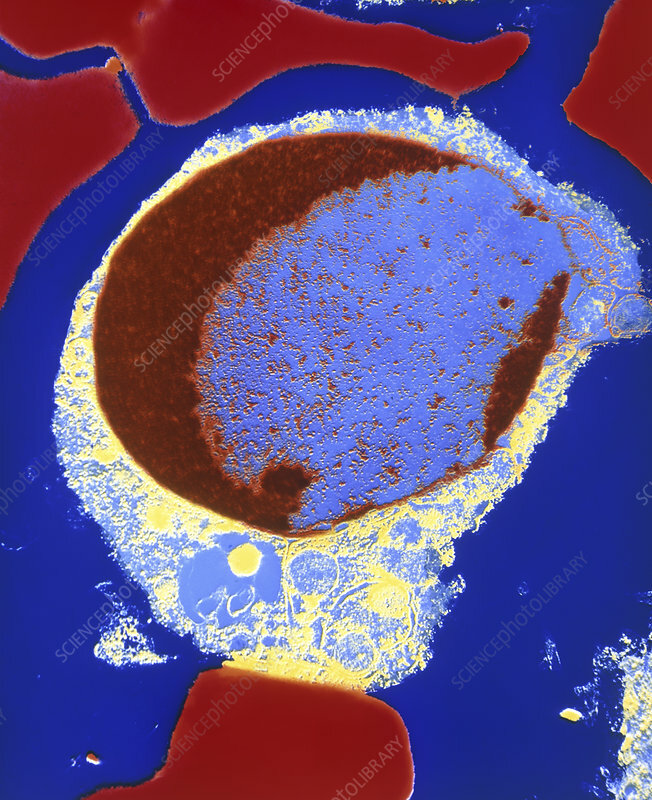 Coloured transmission electron micrograph (TEM) of a white blood cell undergoing apoptosis: genetically programmed cell death. The crescent (red) inside the cell nucleus is characteristic of apoptotic cells, and contains rearranged DNA. Outside the nucleus, the cytoplasm (blue/yellow) is separating into blobs. The cell will shortly burst into fragments that other cells can easily digest. Self-destruction is a normal part of a cell's life and is programmed into its genes. Mutations that prevent apoptosis can lead to the uncontrolled proliferation that causes cancer. This is a plasma cell from human bone marrow. Magnification x3750 at 6x4.5cm size.